There are 31 guest rooms available in the CENTRE DOMUS PATER KENTENICH for guests and those attending meetings. These rooms bear the names of the countries with Schoenstatt Shrine. 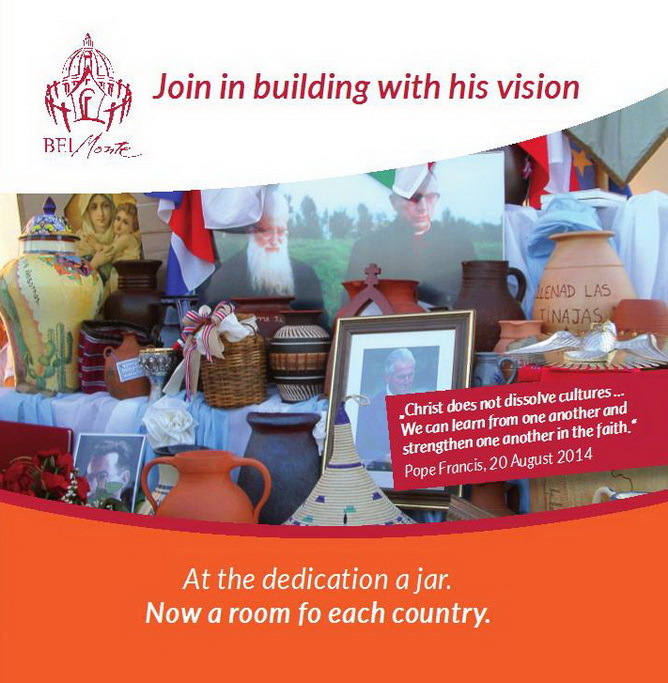 Every country is invited to be present in its room through a picture of the Our Lady of Schoenstatt, a cross and a picture of something something particular of the country. At the consecration of “the shrine of all of us" in September 2004, many original jars were carried to the shrine by representatives of a variety of nations. Ten years later countries are now invited to be visible in "their" room in the Father's house by leaving something of value.Each country is free to choose the design of the MTA Picture, cross and picture that is characteristic for their country. Anyone staying in one of these rooms later would “stay” in the heart and life of the country with its very original mission and culture. Belmonte should be the gift of all countries, a house for all peoples and cultures in the Covenant. Where everyone is able to be, as he is, and all are at home living under one roof with one another, beside each other, in each other. Schoenstatt members, groups and communities from several countries also did a great effort to financially sponsor "their" room at the Domus Pater Kentenich. Each Country is free to choose the design of the MTA Picture, crossand picture characteristic of the country. What will the frame of the MTA picture look like? What cross is typical for your country? What picture expresses your country? A picture of the national shrine? A picture of the patron saint of your country? A picture of an exceptional architectural work or a wonder of nature? Unfortunately statues or national flags on a standard are not possible. Speak to Belmonte enthusiasts and the leaders in your country, do it together, think about how the whole of your country produced this room in the Father's house and how the memory remains in the guests on Belmonte.